The Lesser Frigatebird is an large, uncommon seabird found along the coasts and offshore. They have also been known to follow ships. It measures 30" in length and has a wingspan of 73". 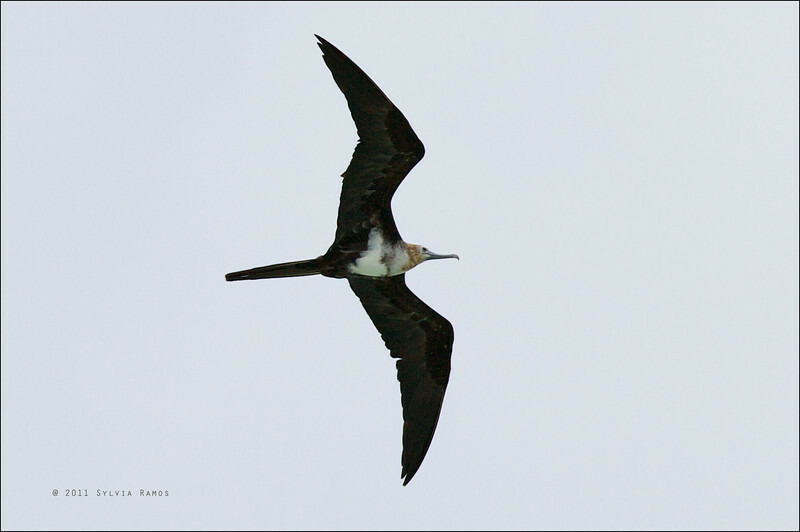 The male adult Lesser Frigatebird has a black head, black underparts, white axillary spurs that are distinctly triangular , no alar bars, and black breast. The axillary spurs are located midway between the leading and trailing edges of the wings. The female adult Lesser Frigatebird has a black head, black belly that extends forward as a rounded point, white rear flanks, white axillary spurs, white concave breast, black throat which peaks in center, clean white collar across back of neck, pink or blue-grey bill, and red orbital ring. The axillary spurs are small and distinctly triangular. The frigatebird identification information that is quoted here comes from David James' article "Identification of Christmas Island, Great, and Lesser Frigatebirds" that was first published in Birding Asia Vol. 1(2004). It is a widely known and well-regarded article. Thank you to David James for confirming the ids and correcting the ages of the birds!